Chicago DJ Equipment Online Superstore - CHICAGO DJ EQUIPMENT WAREHOUSE! While our checkout process is automated, all orders are reviewed by a sales associate to double check that all information is clear. If we see anything that is not clear, does not match up, or even if your equipment is incompatible with each other, we will contact you to make sure all is well. For your safety, and ours, we take fraud seriously. We manually validate all information supplied. In the cases of no-match addresses, we contact our customer immediately to make sure the charges are authorized. We pride ourselves in keeping our customers' information secure. Only non-essential information - such as name and phone number / order number - are kept. All other information is encrypted and stored seperately to prevent identity theft. Our order processors also go through identity theft prevention training to ensure that your information is as safe as possible. We know the concerns people have with giving personal information online - after all, we shop online too - so to ensure that your information is as secure as possible, our shopping carts use double encryption procedures and information is stored seperately from each other. We have made it a point to make sure that our carts are secure enough that we would use them ourselves. We scoure the internet in order to bring you the lowest price possible. 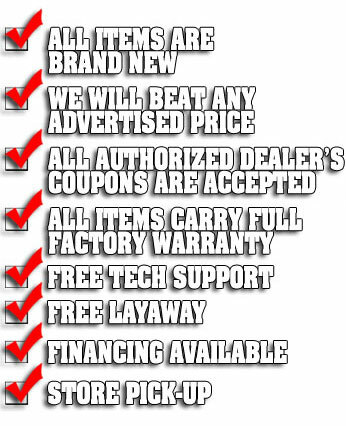 We will match or beat any authorized dealers price on an item, as well as honoring their coupons, specials, deals, and sales. We love your business, and make it a point to do what we can to get it and give you maximum satisfaction.